(Greater Sudbury, ON.) 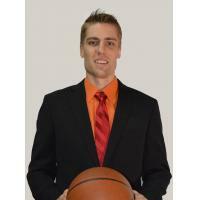 The Sudbury FIVE Basketball team are extremely pleased to announce that Logan Stutz has been named the team's inaugural General Manager and Head Coach. Stutz has played professional basketball for eight season and will take the leadership role both on and off the court following his retirement from the NBL Canada in 2018. His last player role was as the captain of the 2017-18 Windsor Express who lost in the Central Division semi-finals to the St. John's Edge last April. Stutz was named the NBL Canada MVP in 2015-16 and captained his last two teams, the Niagara River Lions and Express over the past three seasons. He has coached at various academy levels throughout his career which has taken he and his young family from his roots in Kansas City, Missouri throughout the United States, Asia, Europe and Canada before finishing his playing career for the 3D Global Sports Canada where he won a Gold Medal. "My family and I are very excited to join the Community of Greater Sudbury here in Northern Ontario," said Stutz. "I am personally honored to be the first GM/Head Coach of the Sudbury Five, and am fully dedicated to give this city a basketball experience that fans will fall in love with and be proud of." VP of Basketball Operations, Bob Johnston who led the hiring process said, "Hiring Logan is the result of an intense recruitment search and a very lengthy vetting process of numerous highly qualified candidates for the position. I am extremely pleased that he has agreed to join our organization, bringing with him an abundance of energy and passion with a mutual vision of building a championship team and a flagship franchise within the National Basketball League of Canada". Fans can anticipate in the next few weeks the 2018-19 season schedule release along with player signings expected over the next few months through the various combines and free agent signing periods prior to players arriving in November. It is an exciting time to be in Greater Sudbury and cheer on all the sports and entertainment action that will be taking place in the Sudbury Arena this winter. The Sudbury Five are a member of the NBL Canada which is set to release its 8th regular season schedule for the 2018-19 campaign. You can follow the league or the team through a number of social media platforms including Instagram, Twitter, You Tube and Facebook as well as the official team website www.thefive.ca. The Sudbury Five Season Ticket Memberships are on sale now through the Arena box office at www.greatersudbury.ca/tickets.